ESPN’s college basketball conference tournament coverage took up all of the Top 5 slots on Saturday cable, with the ACC leading the way with 1.17. (Other tournaments on ESPN2 and FS1 also made the chart.) 4 of the next 6 slots went to the various hours of HBO’s boxing, all in the 0.42-0.31 range, and an episode of SPORTSCENTER was at #9 on the sports-intensive day. The only non-sports show to make it into the Top 11 was an episode of HOUSE HUNTERS RENOVATION (HGTV), up a tick to 0.42. Elsewhere, BLACK SAILS (Starz) was up a tick to 0.17. 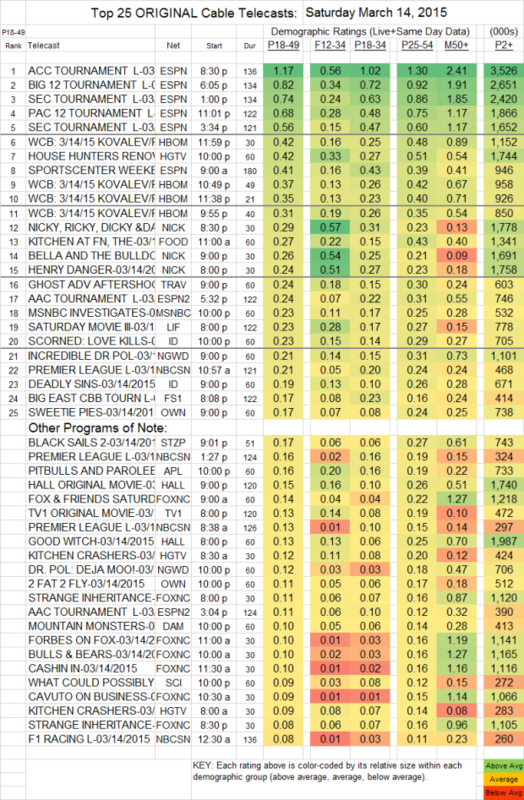 THE GOOD WITCH (Hallmark) took a heavy hit, down a tenth to 0.13.